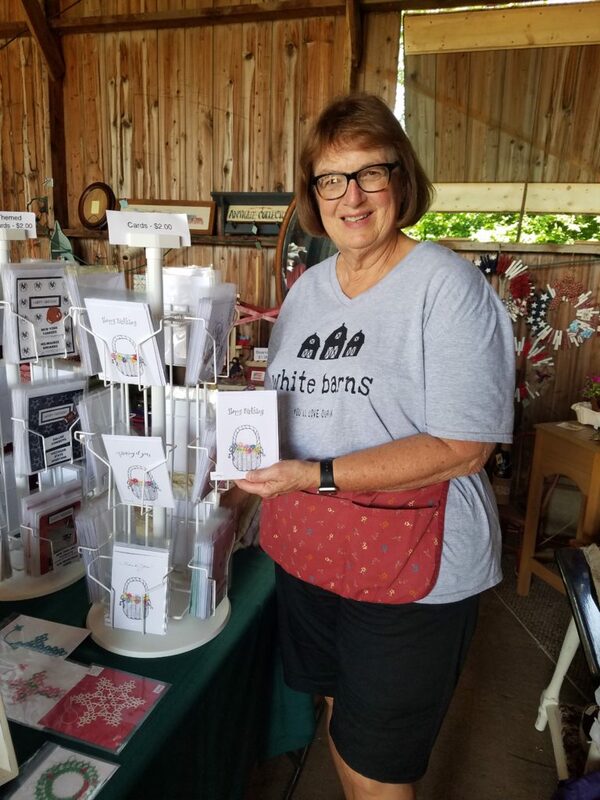 Last Saturday we were able to go over to the White Barns event to check out the vendors. The farm is about 4 miles from me so it is a quick drive. Barb, Kim and I were able to go as Dawn was working on getting ready for her daughter’s graduation party the next day. 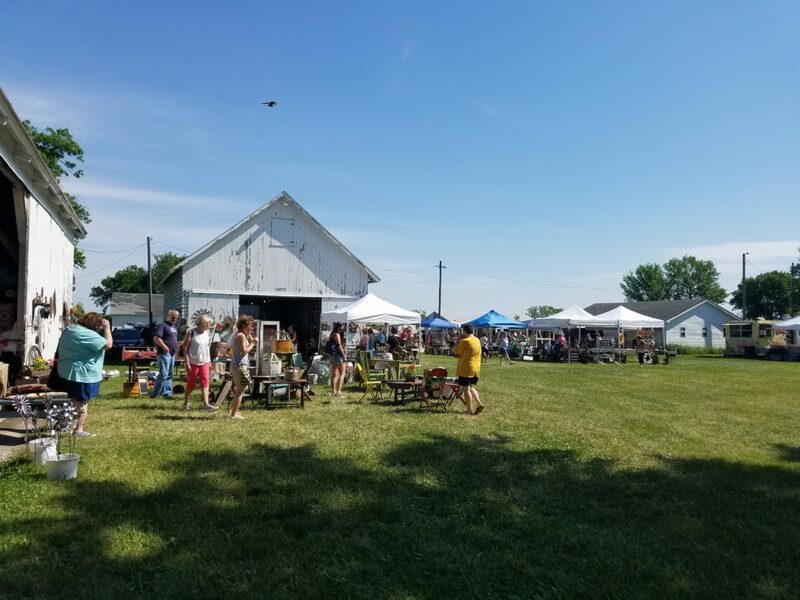 The family that sponsor this does a wonderful job at setting this up, it is clean, organized, rides from the parking field, food and drink available, music, restroom facilities, handicap accessible and just $3.00 admission. They have it in the spring and fall, and this year there were many more vendors. 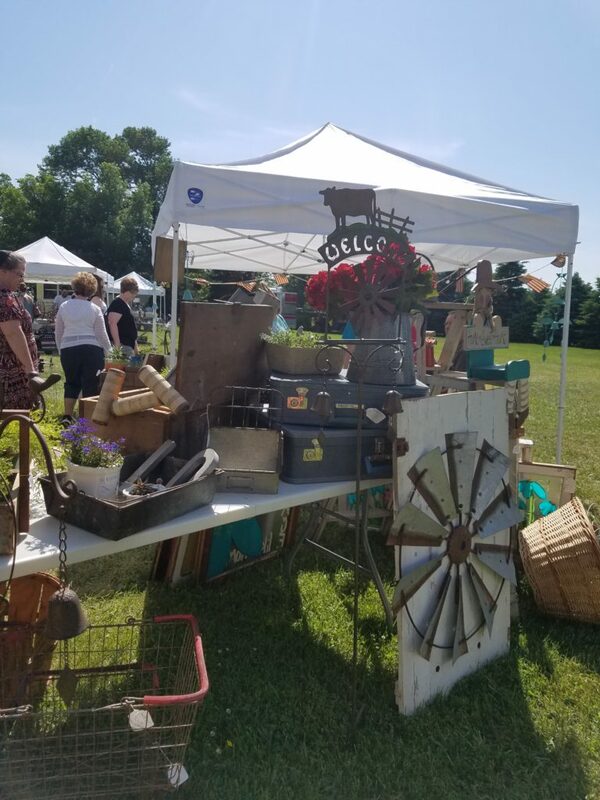 The vendors sell homemade items, refinished furniture, vintage items and collectibles. I will share a few with you. Our favorite gal to visit is Bonnie, you can check her out on Facebook! 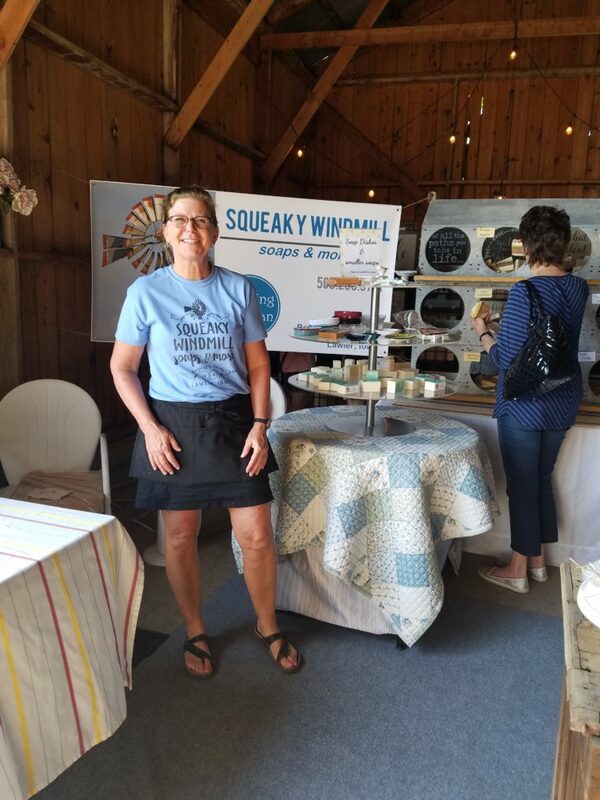 Squeaky Windmill Why is she the main reason we go to this event, well it is because of the homemade soaps she makes. They are fragrant, have beautiful texture and color and the scent is true to name, such as “Herb Garden” and “Cotton Candy”! Bonnie is a wonderful down to earth, honest and hard working gal. Their farm was just across the gravel road from ours and she is a few years older than I, so in the spring she and her sisters would come over and help pick rock, they were “good help” my parents would say. As a young girl I clearly remember they got to wear bikini tops and my parents said I had to wear a shirt! Funny how that was a big deal to me at the time! 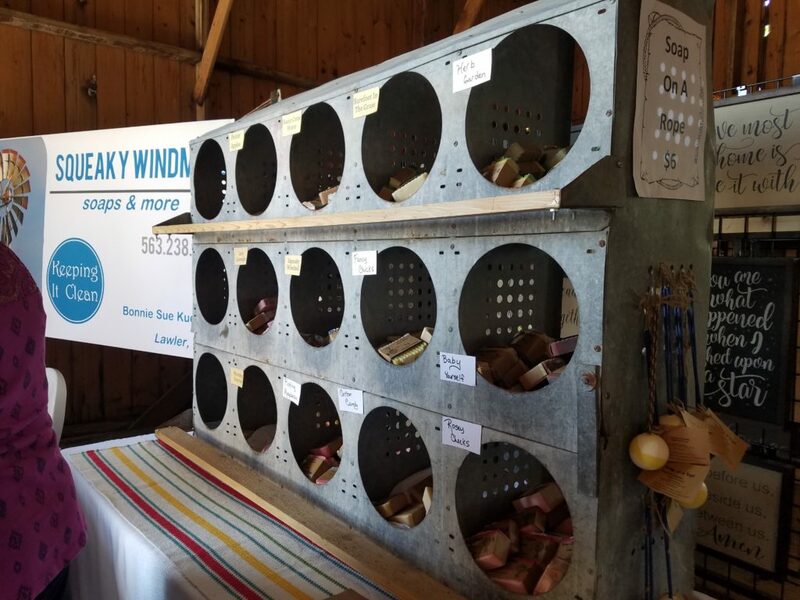 This is how Bonnie displays all of her soaps at events, (chicken nesting boxes) a super cute idea. Another vendor who has always been there is Marilyn who makes these lovely tatted cards, like the Happy Birthday one on the first photo. 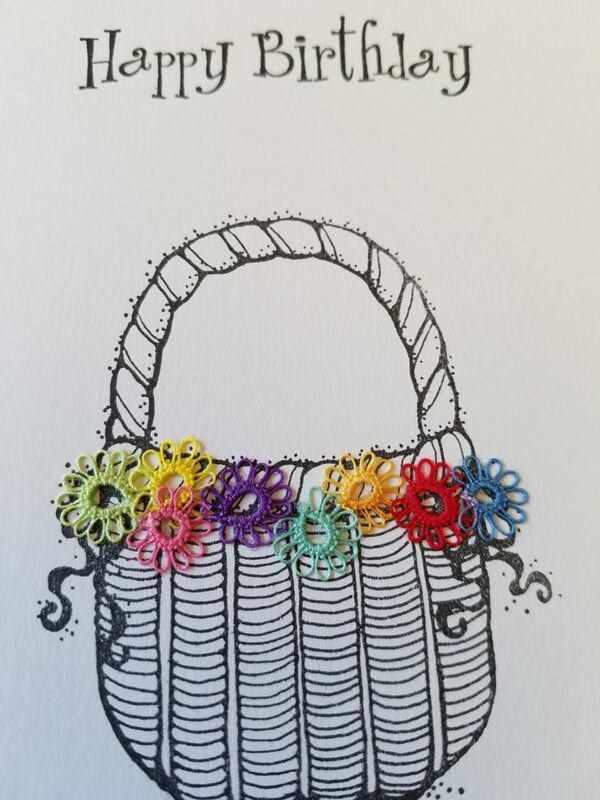 She has such a nice assortment of white cards with black sketched images and a little pop of color with the tatting. I feel it is a beautiful special card to send to those who you know will appreciate the handiwork. 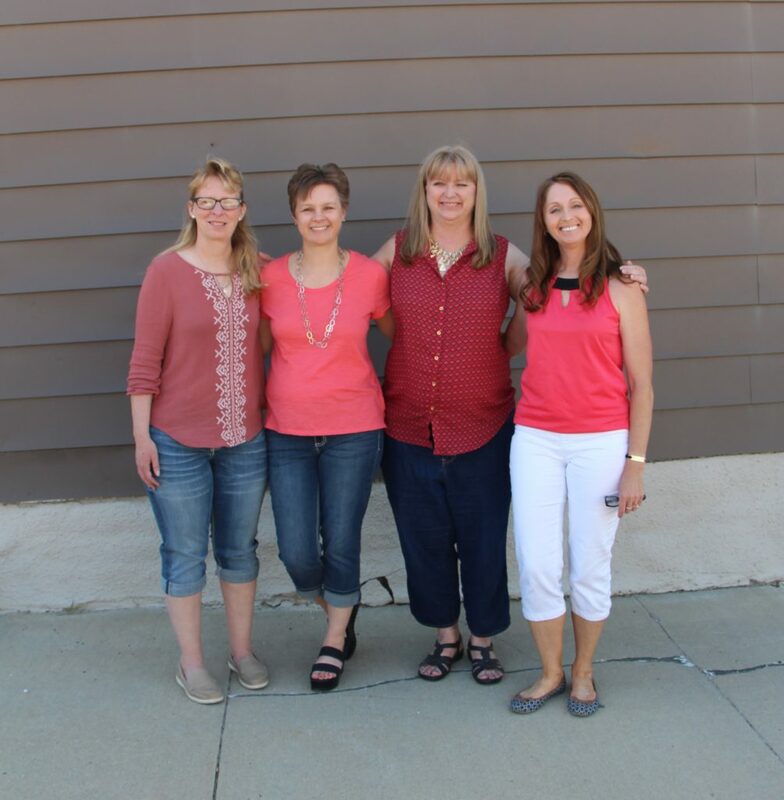 You can contact Marilyn at mheitman46@gmail.com. When I was just a teen I worked the night shift at the local nursing home and when we had down time a co-worker, Clara, who was in her 60’s would tat. I was so amazed at how she did that and I loved to watch her old dark wrinkled hands create something so beautiful and delicate, I will learn how to do tatting someday. Across from Bonnie was this lady who makes and sells the american girl doll clothes, can you see how many there are! 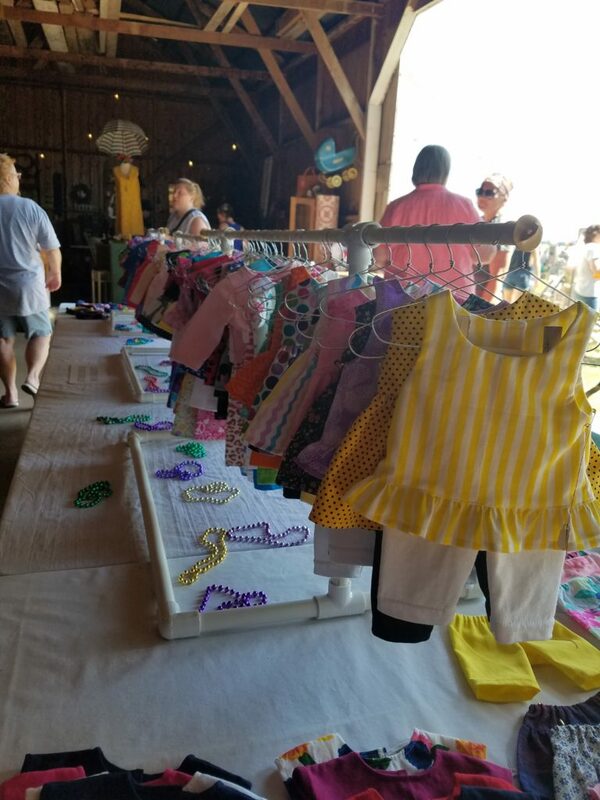 There were so beautiful and such an assortment, anyone with a little girl would be sure to find an outfit for her doll. 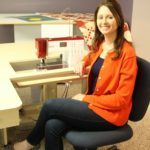 We came across an old iron, I sure am thankful for my Oliso iron I use on a daily basis as this one looks like a lot of work! 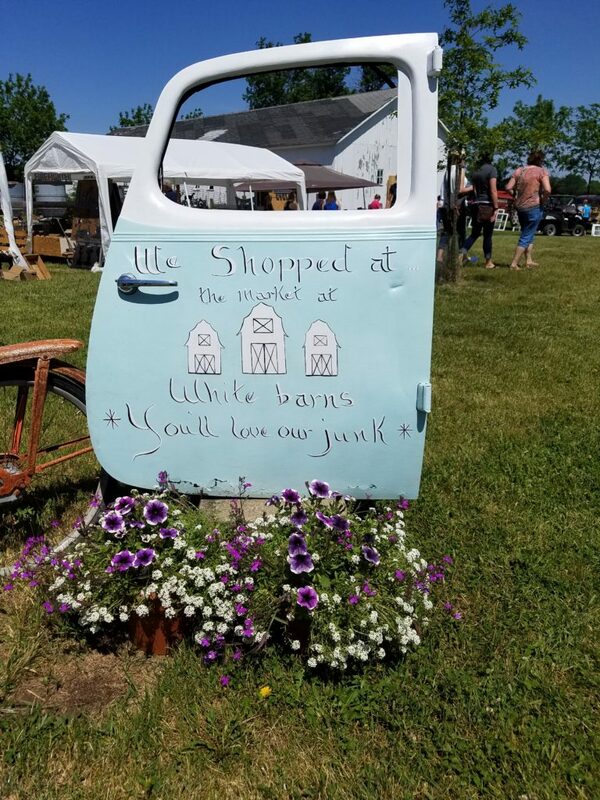 Here a couple of photos of the vendors on the farm. 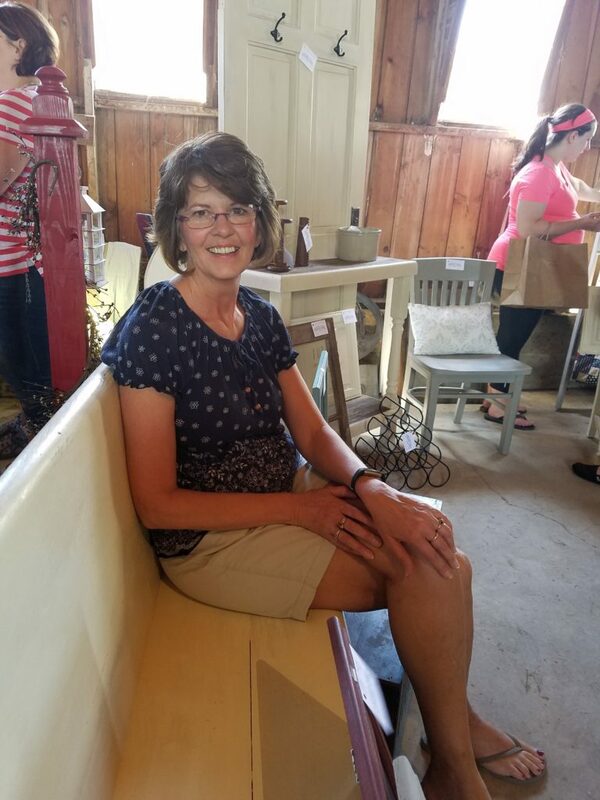 Robin at Volga Lake Vintage is an old friend and she has been refinishing furniture the past few years, when I talk with her I can tell she truly enjoys doing this, to the point where she has done so many pieces she needs to sell them. Here she is on a beautiful church pew that she has painted and the piece behind her, she and her husband designed, a unique piece. I was on the lookout for textiles, old quilts and hankies, but it seems like a few of those vendors were not there as in the past, maybe next time. I did meet Lauren, a new vendor, she was a peach to visit with! 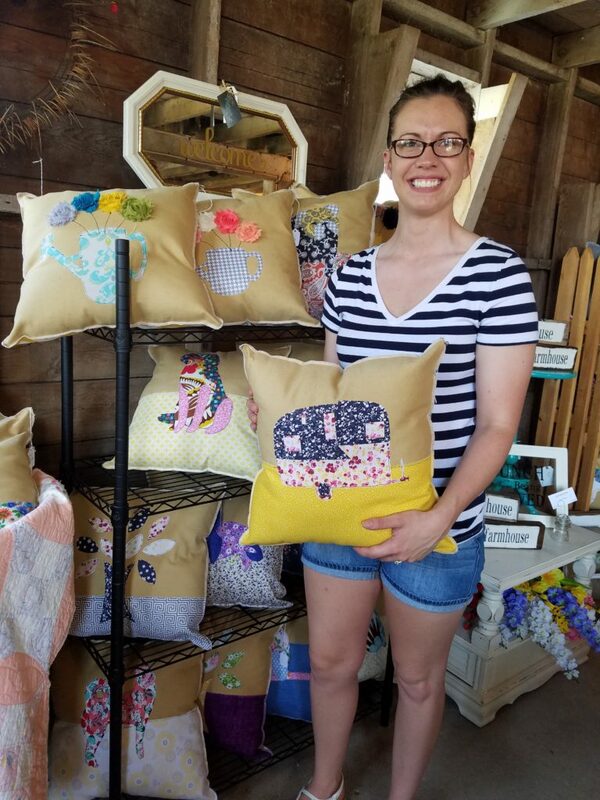 Look at what she makes, these cute vintage inspired pillows, she had lots of them. I enjoyed looking through them all, but what I really liked was her passion for design and creativity. I love meeting people who are excited about their craft and are willing to chat about it. I feel she has found her niche and wish her well with it. 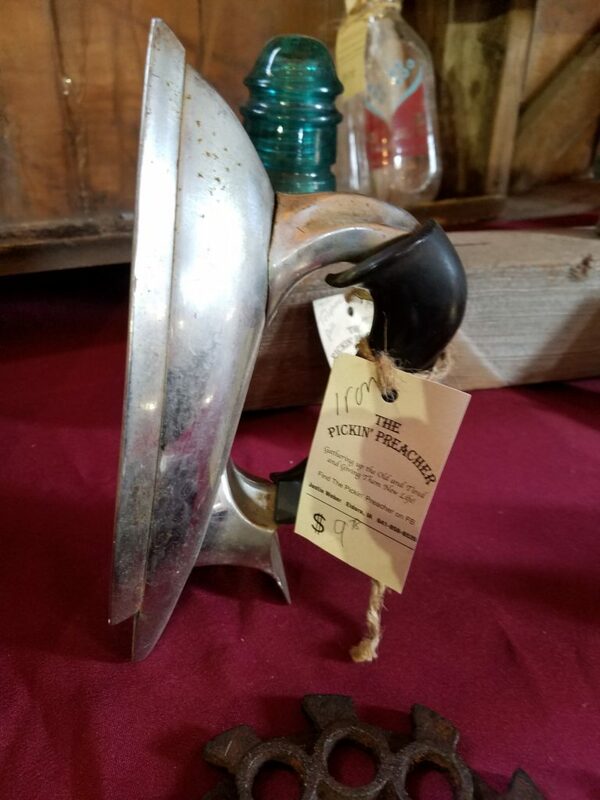 Please check out her page, The Patina Patch. 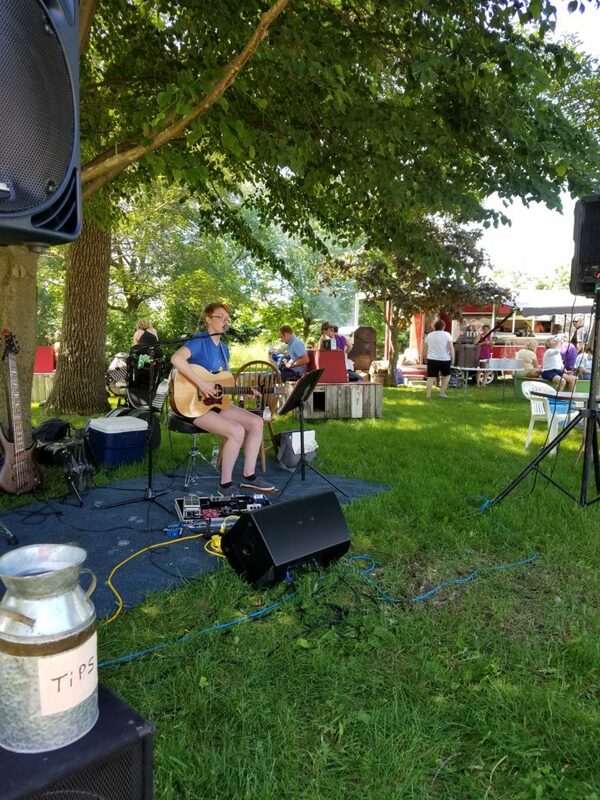 During our time shopping we also had great folk music in the background, a young gal playing and singing beautifully, I am not sure of her name but her father was with her and you can find them at Bruce Bearinger. This entry was posted in Uncategorized on June 9, 2017 by Carla. We had fun at White Barns too. Sometimes it’s just nice to get away without having to go to far.